Adult must be a member in good standing of TLAFA. Minors must be a child/grandchild of a member in good standing. A member in good standing is a paid club member prior to the second Wednesday of June. Contestant must attend the Queen’s Mandatory meeting. If the contestant is a child and cannot attend, they must be represented by a parent or legal guardian, no exceptions. All contestants under the age of 18 must have entry form signed by a parent or legal guardian. Contestants must have their own horse (owned or borrowed). No two contestants may ride the same horse. 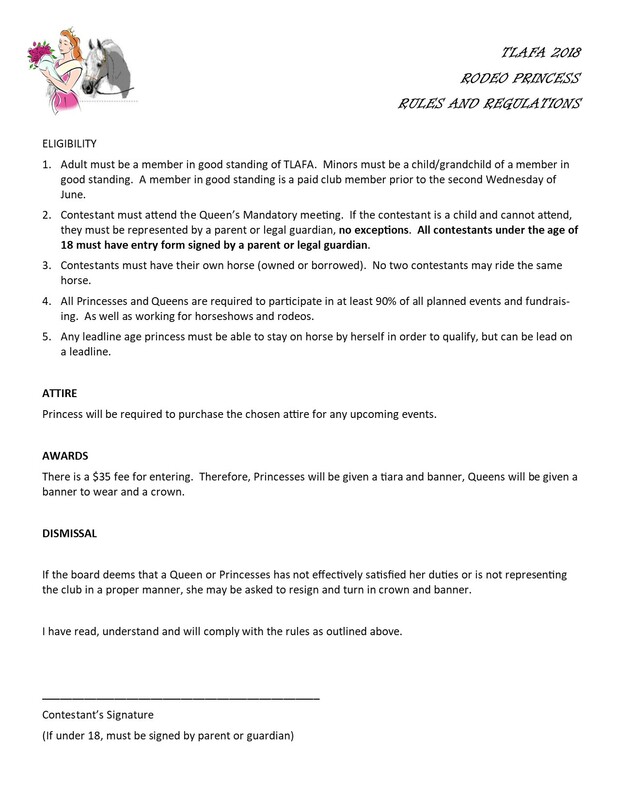 All Princesses and Queens are required to participate in at least 90% of all planned events and fundraising. As well as working for horseshows and rodeos. Any leadline age princess must be able to stay on horse by herself in order to qualify, but can be lead on a leadline. Princess will be required to purchase the chosen attire for any upcoming events. There is a $35 fee for entering. Therefore, Princesses will be given a tiara and banner, Queens will be given a banner to wear and a crown. If the board deems that a Queen or Princesses has not effectively satisfied her duties or is not representing the club in a proper manner, she may be asked to resign and turn in crown and banner. You may download a copy of the rules and application below. For more information contact Katie Lyons, Queens/Princess Chair.